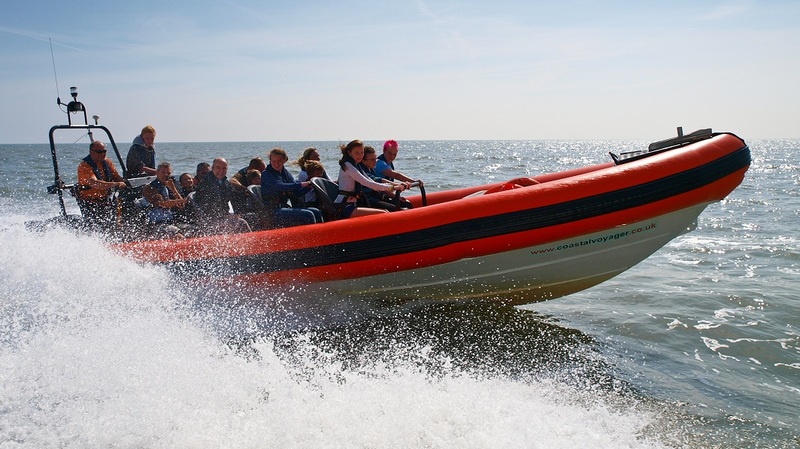 As part of our Work Club Summer Programme 2014/15 the Young People went out on Coastal Voyager. The activity is designed to build the young peoples confidence, communication skills and team work. Their challenge of the day was to pilot the rib boat from Southwold to Lowestoft. The nine young people, who took part in this activity, first leant about sea charts and how to read them. They then went on to learn how to use a compass and the chart together. Marcus the skipper then went on to talk about the safety rules on the Rib boat and sea. The young people then split into two teams and went on to the two boats. They then took it in turns to pilot us from Southwold to Lowestoft. The young people took it in turns to navigate, and pilot the rib boat. This involved them communicating to each other and working as a team so as to arrive safely. They learnt about the bouys out at sea and bringing the boat into the habour. Everyoone then had lunch and a stretch of their legs before the students then piloted us all back to Southwold. “I have had an amazing time and feel that I have learnt so many new things by doing this. I loved learning how to make the boat wet everyone as we went through the waves"
I wanted to write a note to say just how much fun we both had on Sunday with you. My wife was beside herself which was so nice to see. We haven't stopped talking about our trip since and were on a high until we got home at 9pm. I've never had such a sensation on water before, the storm added something to the mix as well I think. It was the icing on the cake for a special surprise weekend for her. I hope the 50th cruise was ok that night and they didn't get too wet. We will no doubt see you again another day whether it be karting, shooting or another boat ride. Keep doing what you are doing, you make everyone feel special which is getting rarer these days. The Voyager experience has a lot more to offer than I first expected. I just want to say a big thanks to the Voyager Team who have delivered a professional and rewarding experience to the students at Bungay High School. The team building activity was inspirational and offered so many great learning experiences in planning and taking Voyager to Lowestoft and back. The students gained so much from the experience. More recently the health and safety activity you delivered has helped our Sixth Form students complete a unit of their advanced level studies. From the moment we arrived they were fully engaged and the risk assessments they completed came to life during the fast boat experience. The work they produced from this saw 80% of the group achieving distinction, which is the best we as a school have achieved off any single unit of work. I will be contacting you again soon as I would like to ask the Voyager Team to work on developing a programme to engage some our disaffected students and also use it as part of our rewards package. lovely trip, even though I wasnt brave enough to do the BLAST! this morings trip was brilliant! thanks Coastal Voyager and GROUPON! What an amazing ride today. Thx sooo much. Hope the video came out ok.